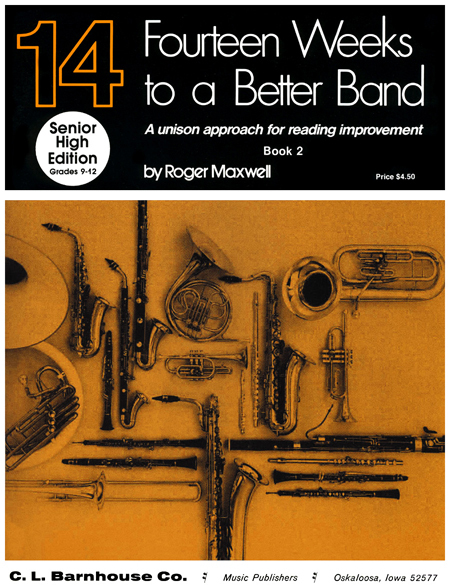 Roger Maxwell's "14 Weeks to a Better Band"
In 1972-73, I conducted a pilot study in Iowa which involved 18 high school bands. The purpose of the study was to see whether bands could improve their reading ability by concentrating their practice to one rhythmic figure per week. The bands used my pre-publication book titled “Fourteen Weeks to a Better Band.” Table 2 below lists information pertaining to each band. 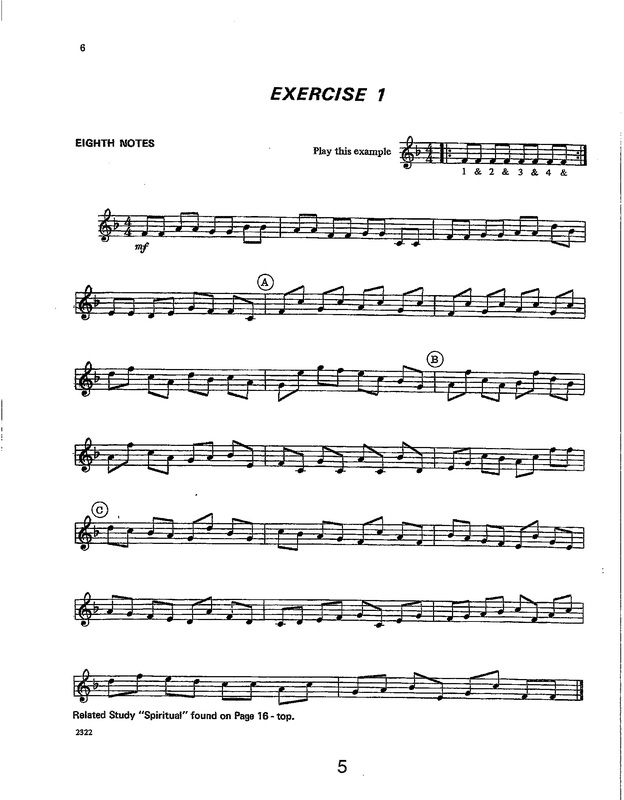 Exhibit E below lists the eleven Rhythmic Figures used in the study. Again, this represented an overall reduction of 44 percent. Likewise, in their final readings of “THIRD SET FOR BAND,” the ARM bands reduced their overall reading errors to 1.5 at the end of the 7th week. 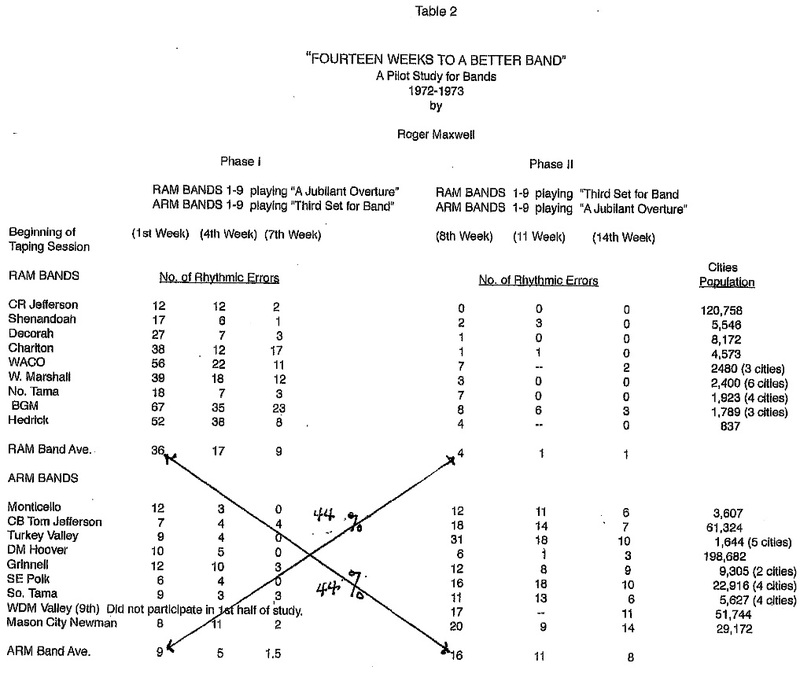 The RAM bands in their third and final reading of the same work reduced their overall errors to 1 at the end of the 14th week. Again, please refer to Table 2 below. At the conclusion of the study, I shared the results with the C.L. Barnhouse Music Publishers. The company was so impressed with the results they published “Fourteen Weeks to a Better Band”. How was it possible that seven of nine bands did not make a reading error during their 3rd and final reading of “Third Set for Band by Jared Spears?” One band made 2 reading errors and another band made 3 reading errors. How were bands able to reduce their reading errors by 44 percent overall during the pilot study? How were small Iowa high school bands able to read music as well as larger high school bands considering that students in small schools were engaged in extra-curricular activities such as basketball, volleyball, track, soccer, golf and drama? In order to try to answer these questions, I read a number of peer review studies used with the permission of the International Music Products Association (NAMM) formerly known as the American Music Conference. The majority of these studies as generated by universities, colleges and high school association throughout the United States focused on academic excellence and achievement. As I found nothing comparable to my study, I knew from our study that something happened within the brains of these high school students which allowed each rhythmic figure to become permanently embedded in their brains. Not being a neurologist, I did read a limited number of papers and studies as they would pertain to music and the brain. I found that a limited number of members in the neurological community differ as to the number of neurons and synapses contained in the human brain. The number ranged from 90 million to 125 trillion. From these studies, I felt that I had found a scientific explanation as to how neurons and synapses interact in providing music to the brain. This information allowed me to understand why our pilot study was successful. When a student played a single rhythmic figure repeatedly, that figure was received by millions, perhaps billions, of neurons and synapses thereby allowing it to become permanently embedded in the brain. The illustration found on the next page gives a graphic explanation as to the process. The eyes see two eighth notes on the staff. This information is sent to a waiting neuron in the brain which comprehends what the eye has sent. A waiting synapse receives the information from the neuron and transmits the information (two eighth notes) to a receiving synapse via an electrical current. A receiving neuron accepts this information from the sending synapse. Now, consider this simple explanation, the interplay between neurons and synapses, to be multiplied by one million (1,000,000) to two hundred million (200,000,000) or more neurons and synapses. This process (the playing/singing of two eighth notes over and over through lessons, practice, rehearsals and concerts) allows the eighth notes to become again, permanently embedded in the brain for the remainder of a person's lifetime. The reason why bands, individually and collectively, were able to make major improvements in their reading abilities was because students were able to concentrate their practice to one specific rhythmic figure per week. When all major rhythmic figures become embedded in the brain, each rhythmic figure responds as needed when reading a piece of music. In bringing this study to a close, I firmly believe that our research is once again supported by indisputable evidence. 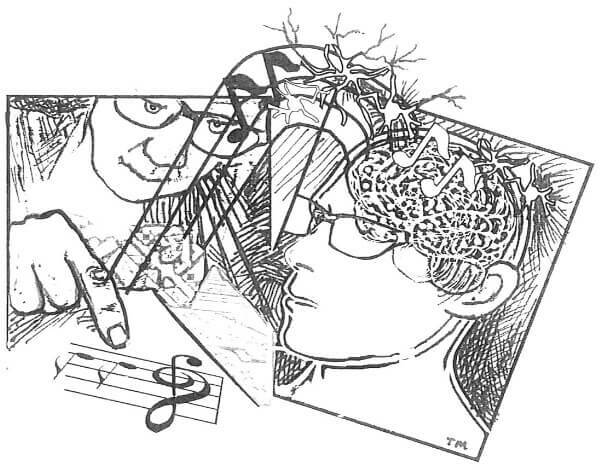 If students have the opportunity to learn one specific rhythm at a time, they can be assured that music will be permanently embedded in their brains for as long as they shall live. The above numbers are based upon each exercise and related study being played twice a day to develop sight reading improvements. Roger Maxwell graduated from the University of Northern Iowa (formerly known as the Iowa State Teachers College) where he was one of the founding fathers of the “Dimensions in Jazz” program. In May 2016, he was inducted into the University's School of Music's Jazz Hall of Fame. He served as a trombonist, rehearsal conductor and arranger for the U.S. Army Band of the Pacific while stationed in Honolulu, Hawaii. While teaching in Brooklyn, Iowa, his pep band introduced music to the Iowa High School Girl's State Basketball Tournament in 1966. In 1982, he conducted “Everyone Sings the Messiah” at the Des Moines Civic Center. This “unrehearsed performance” of “the Messiah” was one of the largest presentations in the U.S. with an estimated 2000 singers participating. In 1999, he and his wife traveled to Japan where he introduced his instructional book “Innovations in Jazz” to bands in the cities of Kofu, Takasaki, Hammamatsu and Shimizu.